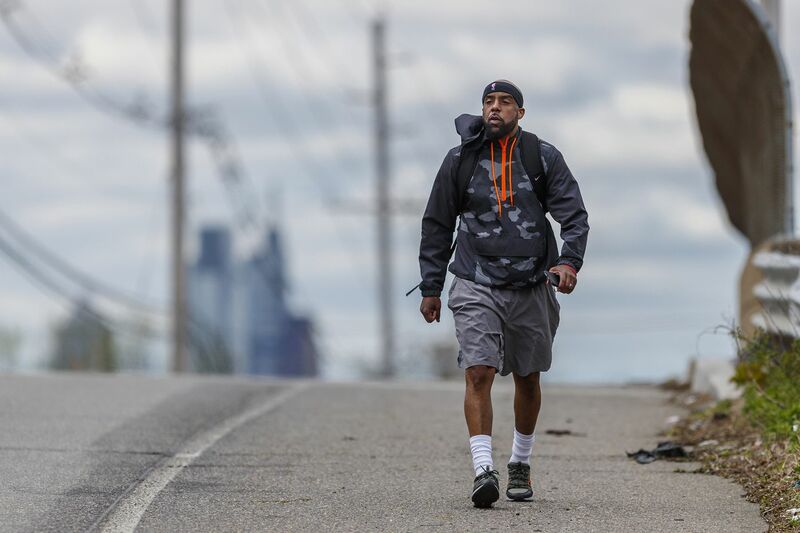 Keith Benson, the head of the Camden Education Association, walks along River Road in Pennsauken on his way to Beverly, N.J., for the first leg of his three-day walk to Trenton from Camden, to protest budget cuts that will shut several schools and possibly cause up to 200 layoffs. Camden activists began a three-day march Monday to Trenton to meet with lawmakers to demand more funding for the city’s traditional public school system to avoid layoffs and school shutdowns to close a $27 million budget deficit. Keith Benson (center left), the head of Camden Education Association, gets a hug from one of the students from Veterans Memorial Family School who met him on the first leg of his walk to Trenton from Camden, to protest budget cuts that will shut several schools and cause as many as 200 layoffs. Veterans Memorial Family School is one of the schools slated for closing by the Camden School District. After a brief rally and prayer in downtown Camden, Keith Benson, president of the Camden Education Association, began the first leg of the march to Trenton. He walked about 13 miles to Beverly. “We’re out here to try to fight for our schools,” Benson said at the union headquarters. Acting School Superintendent Katrina McCombs unveiled a sweeping plan last week to relocate about 900 students by closing a school and an annex, reconfiguring a third building, and cutting several hundred jobs. Critics have called for a freeze on cuts and school closures and want a federal probe into the district’s spending. McCombs cited a budget gap for the 2019-20 school year, as well as long-term enrollment and facilities issues plaguing South Jersey’s largest school district. Camden has been operating as a state takeover district since 2013. If the district receives $27 million in emergency state aid, that funding could help reduce the projected layoffs, McCombs said in an interview. About 50 to 200 positions could be cut, she said. “It’s a moving target. We’re still advocating,” the superintendent said. Even with additional aid, the district plans to close Veterans Memorial Family School, which needs $14 million in repairs, and the Bonsall Annex. Also, Riletta T. Cream Elementary will be turned into an early-childhood center, she said. The biggest impact would be felt at Veterans, which has about 500 students in kindergarten through eighth grade. Some students will be sent to Davis Elementary, while bilingual sixth through eighth graders will be sent to Cramer Elementary, where the district plans to start a dual language academy. McCombs said most of the district’s preschoolers would be enrolled in Cream, which is operating at about 43 percent capacity. Cream Elementary students would be sent to H.B. Wilson Elementary, which will become a K-8 school, and Creative Arts Morgan Village Academy. McCombs said the decisions, widely criticized by union and community leaders, were “excruciating” to make, but would save about $7 million. She said she considered decreasing enrollment, academic performance, and the condition of some school buildings. Veterans, a nearly 80-year-old building, is operating at half capacity, she said. McCombs said the district plans to relocate as many employees as possible to other schools in the event of closings. Under state law, employees must be notified by May 15. The state Department of Education says it is working with Camden and that any proposed cuts are pending. Camden is one of four districts operating under state control. The district has about 1,600 employees and operates 19 schools. Benson and others believe Camden school officials have focused too much on Renaissance and charter schools, which are publicly funded but privately operated, and has ignored its traditional public schools, such as Veterans. More Camden public school students are enrolled in charter and Renaissance schools than traditional public schools. Benson believes the latest proposed changes are designed to move additional students from traditional public schools because they will have fewer options in their neighborhood schools. For the 2018-19 school year, the district said it enrolled 7,520 students in the city’s 19 traditional public schools; 4,340 in 11 charter schools; and 4,400 in 11 Renaissance schools. Camden has had a history of fiscal problems and state oversight. The district imposed layoffs, school consolidations, and closures in 2013 when the state took over with a $100 million budget gap. McCombs said Camden submitted applications to the New Jersey Schools Development Authority seeking $122 million for repairs for its aging buildings. No additional school closings are expected, she said. Acting Camden School Superintendent Katrina McCombs said the decision to close schools and layoff employees was "excruciating." Camden is facing a $27 million budget deficit. Benson, who completed the first leg of his “march of equity” in about four hours, said he was inspired by supporters along the route. More activists are expected to join the walk for the second leg Tuesday, which will begin in Beverly. The march will end at the Statehouse on Wednesday at the state Board of Education meeting and a rally at 1 p.m.